Zebra Lovers- this bow is calling your name! 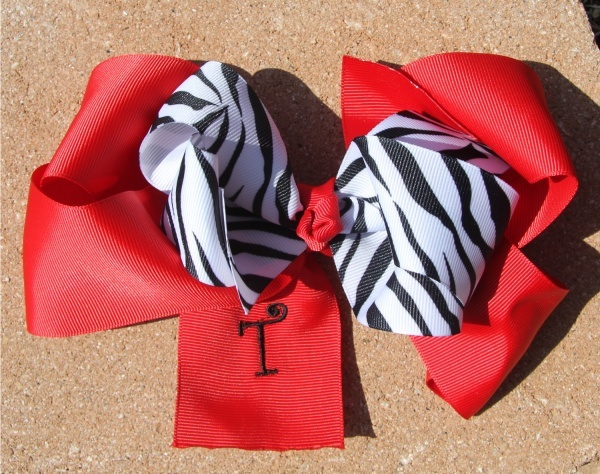 This is a double stacked bow of red and zebra print. The bottom is an over sized red 2.25" grosgrain bow. The top layer is a 1.5" zebra print grosgrain bow. Stacked together and wrapped with a red grosgrain ribbon and attached to a French clip. This picture and video does show the added feature of embroidery, make it hers with her first initial. If added, it will be a 1" letter in Mono Curls Font in black thread.